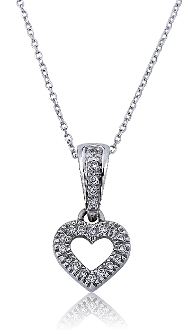 Beautiful and brilliant, this open round cut Diamond heart design features pave-set Diamonds, shimmering in 10 Karat white gold, with a glittering Diamond filled bail creating a striking pendant with a flirtatious modern flare. Designed featuring 0.10 Carat t.w. brilliant round cut Diamonds, this look comes complete with a 16 inch 14 Karat white gold Rolo link chain.